I will help you to create your website from scratch. You don’t need to have a technical knowledge to do. Just follow my pieces of advice. Your first step in making your own site is to register a domain. What is domain? The domain is a unique name, directing to a web page. For example, facebook.com, google.bg, abv.bg, vbox7.com and etc. The domain is usually registered for a 1 year period and costs approximately $ 10-15. It should be renewed each year. If you stop year payments you won’t be able to use your domain. You need also hosting. The web hosting is a service, supported by a specific company, which allows you to store your website to a server so it would be permanently accessible to visitors all over the world. It is kind of renting a server space for a specific period. For registering a domain and hosting you can use services of different companies who provide different hosting plans that you can choose from. www.SiteGround.com is one of the sites you can use for searching a free domain name, to register your domain and to choose a suitable hosting plan. Another possibility is www.HostGator.com. Also an easy and affordable hosting. 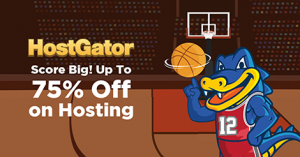 Up to 75% OFF NEW hosting + $2.99 on select domains at HostGator.com!